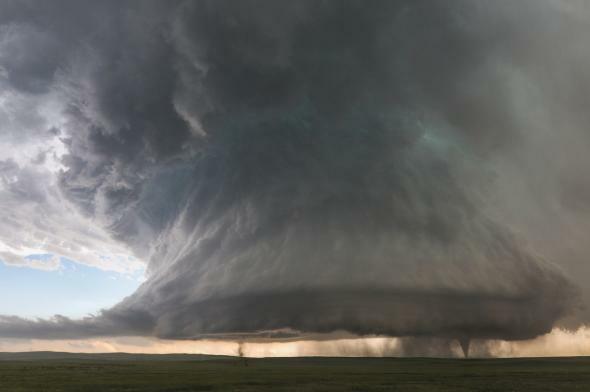 A textbook supercell thunderstorm—complete with twin tornadoes—seen from a rare point of view. On the morning of June 4, weather photographer Kelly DeLay woke up intending to take this photograph. He didn’t think he’d actually do it. Two tornadoes emerging from the same parent thunderstorm is a rare occurrence, but capturing them both on film in addition to the supercell that spawned them is almost unheard of. “There’s a few people around in my circles that have said that this is a shot of a lifetime, you may never see this again, and I believe them,” DeLay said. DeLay’s shot, taken near Simla, Colorado, reminds me of the annotated hand drawings of conceptualized severe weather in my weather textbooks back in college. For a good example, take a look at this schematic of an “Idealized view of a classic supercell, looking west” from the National Severe Storms Laboratory. The only difference is, DeLay’s storm had two tornadoes at the same time. That makes this storm, in particular, even more rare from a meteorological perspective. To get the shot, DeLay followed an atypical storm-chasing philosophy. He doesn’t like to get too close, instead preferring to capture the storm as a whole. That’s a welcome contrast to the extreme persona that modern storm chasing has acquired, thanks to reality TV. Plus, it makes for better photographs. “When you get in close, you really don’t see anything that’s going on with the storm,” DeLay said. Last year, DeLay wrapped up his award-winning five-year-long Clouds 365 project, which he capped off with a one-of-a-kind family portrait. Seven tornadoes were reported in Colorado on June 4, including the one Slate’s Phil Plait saw near Longmont.